Mark Stoddart is the creative entrepreneur genius behind a number of famous Bronze Limited Edition of sculptured tables that he designs and creates by himself that has been displayed in a number of prestigious places around the world. But with international customers , to name a few, like Frankie Dettori the Italian horse jockey, King of Saudi Arabia-Salman Bin Abdulaziz Al-Saud and Sir Elton John the UK pop singer, some may not immediately recognize or know that although based next to a famous hotel and golf club resort, Mark Stoddart is not based in America. I actually apply my trade in the Ayrshire coastal town of Turnberry, next to Trump Turnberry which is owned by the American President Donald Trump. From my base in Turnberry and from my own designs I have gained a growing international reputation for my own unique take on things. From an original idea I had with my brother-in-law I came up with the idea of designing an object that would replicate something that would have touched most people’s lives in some way so the original idea behind ‘Apollo Lunar Module Table’ was soon launched. In recognizing that space has developed and invented new ideas that we all take for granted this was further evidence and proof in wanting to recognize this by me wanting to create the ‘Apollo Lunar Module Table’. It’s now 50 years since American Astronauts Neil Armstrong & Buzz Aldrin landed on the moon with the Apollo Lunar Module and recognizing with his links with Scotland, the first man on the moon “Neil Armstrong took a piece of Armstrong tartan with him to the moon”. Buzz Aldrin is also a proud owner of one of the tables that he displayed in the Smithson Institute a number of years ago to celebrate the 100th year of aviation. 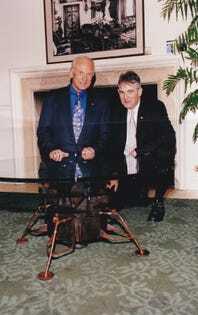 Sir Patrick Moore who did the A-Z for the 1969 moon landing – also was a proud owner of one of the Apollo coffee tables. Another story that has generated international interest from Fort William in Scotland to Ford HQ in America was when I was being approached to oversee the making of a bronze sculpture of an exact replica of a Model T Ford. The original idea was to mark the 100th anniversary of a publicity stunt that took place in 1911 by a local Ford garage in Edinburgh at the time to drive a Model T from Edinburgh and right up to the top of Ben Nevis, the tallest mountain in Scotland. I oversaw the arrangements in designing & to make the bronze tyre tracks. I worked with a local foundry to make this possible. This task was only finally completed through the intervention of the former World Formula 1 Champion Sir Jackie Stewart who managed to obtain a legal document from William Clay Ford Jr. the Executive Chairman of Ford Motor Company, the great-grandson of company founder Henry Ford, to allow use of the Ford logo on the bronze sculpture of the Ford Model T Ford. Henry Ford who created the Model T was also entrepreneur and his entrepreneurial spirit still exists today with the Henry Ford Entrepreneurship Academy.